Companies in Northwest Indiana are betting on the area, and the proof is in both recent new construction/renovation projects and ones in the works. Industries ranging from education to hospitality—and everything in between—have invested resources to build or rebuild high-tech, high-touch, attractive and energy-efficient structures. Several Northwest Indiana companies’ have taken an innovative approach to form and function and what these buildings mean for the Region and beyond. Call it a win-win for the Porter County Career and Technical Education program and posterity. 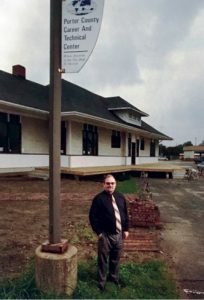 When Canadian National Railroad applied for a permit to demolish the historic depot in Valparaiso, four years ago, Jon Groth knew something had to be done to save it. Groth is the director and principal of the center, which provides vocational and career education programming for high school youth. When there’s a will, there’s a way, as they say. Groth raised $300,000 to move the century-old building an eighth of mile along the tracks to the school. According to Groth, the community pulled its weight financially. The donations came from a combination of corporate gifts, individual donors and grants. Once funded, the students from the building trades program worked for three years to restore the historic gem. He said the restoration process was a learning experience, which challenged them to put textbook knowledge into practice. For example, there was a lot of demolition work needed inside, as well as decking on the exterior. Another challenge was honoring the building’s rich history while transforming it into a modern salon. Groth said they kept certain original elements, like the tall ceilings with crown molding and antique glass windows. The building was move-in ready in fall 2018, when it re-opened as The Hair Depot, the classroom for the educational center’s cosmetology program. Groth said that, while significant progress has been made, they are still looking forward to the final touches. In the meantime, he said public sentiment about the restoration has been positive, and he’s energized by the progress. In neighboring La Porte County, a health system has plans for a new hospital and its public-centric approach—marked by its commitment to remain at its current site at 1007 Lincolnway. “We set out to design our new hospital in the middle of downtown, because we want to be an important piece of the downtown (La Porte) community,” said La Porte Hospital CEO Ashley Dickinson, adding that the hospital is the largest employer in La Porte. La Porte Hospital broke ground on a new $125 million facility in August. Hospital officials say it will be a significant asset to the community, especially when it comes to emergency and acute care. So, what’s on tap for the design of the future facility? To that end, she said they engaged an architect who has designed similar projects in other communities and knows how to put the patient experience front and center. From a design standpoint, the new hospital will include a mix of traditional brick and stone and large windows to bring in natural light. The latter will improve patient experience and overall energy efficiency, per the hospital’s website. Additionally, the hospital is sourcing steel frame supplied by regional steel mills. This project is slated for completion in summer 2020 and operational by fourth quarter of that year. In the meantime, Dickinson said they have contracted with several Northwest Indiana vendors to complete construction. They will continue to operate in their current hospital as they build the new one. Facilities in Gary and Merrillville also have upped the ante when it comes to the health care consumer experience. In summer 2017, Methodist Hospitals announced completion of $12 million in renovations at its Northlake campus in Gary. The project, which took more than a year to complete, included enhancements to its emergency room and intensive care unit, along with the construction of a new ICU. According to Sheila Pochron, Northlake’s director of emergency services and critical care, this project was necessary to keep up with the evolving standards of care in the Region. “We needed to step up our game and give (the community) the quality of care we’re seeing in Northwest Indiana,” she said. That means being in tune with the needs of Gary’s population. It’s no secret that Gary experiences what Pochron referred to as “a high level of trauma,” and therefore, the hospital needed the equipment to better address this reality. There has been a “huge push to bring care to the bedside,” and these renovations help them better execute on that delivery model, she said. The renovated emergency department includes 15 large rooms with nurse work stations, along with a centralized station for nurses and physicians with easy access to every room. It also features a fast-track area for quick treatment of patients with less critical needs. Pochron said they looked to the Southlake campus in Merrillville to gain insight into best practices for setup. As a result, she said providers are happy with the design because it’s intuitive and helps them deliver a higher level of care. They’ve also been able to expand staff, a boon to both the provider and patient experience. 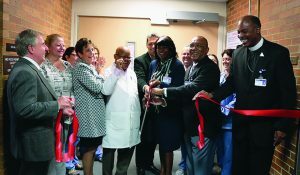 In October, Methodist Hospitals celebrated the completion of a major renovation of its labor and delivery unit at the Southlake Campus in Merrillville. The unit was renamed the Maternal Infant Care Center to better reflect the scope of amenities onsite, which include six renovated labor and delivery suites, six private post-partum rooms, advanced technology and two fully functional nursing stations, according to a statement from Methodist. This project called for a complete demolition and rebuild of the unit in phases, for a total cost of $3.6 million. The project engineer was Stantec in Chicago and the contractor was Berglund Construction, which has an office in Chesterton, per the company’s statement. These projects are the result of the competitive landscape of health care in the state. Facilities all over Indiana are vying for market share, and upgrades and renovations like the ones highlighted are one means to attract consumers. Total health care spending in Indiana was $5,708 per person in 2016, making it the 13th-highest nationwide, according to a report from the National Care Cost Institute, an independent, nonpartisan research institute based in Washington, D.C.
Health care may be a major economic driver in the Region, but there’s more to the story. Hospitality is another growing industry, as evidenced by the recent opening of a bespoke hotel. The Fairfield Inn & Suites by Marriott Fair Oaks Farms, which opened in January, is built on an agritourism destination just outside of Chicago. According to Fair Oaks Farms’ Chief Strategy Officer Michael McCall, the $16-million hotel is part of a larger guest experience—one that has been evolving for some time. The farm attracts hundreds of visitors a year, he said, but until recently, there was no lodging on site. This presented an opportunity. He said the concept for the hotel had been under review for five years, and the completed property represents “a missing piece.” His team approached Marriott with the idea, with a caveat. “We said, ‘we respect your product, but we want this to be a really special product,” he said. They came to an agreement, and the hotel reflects certain elements of the Marriott brand with a twist—what McCall referred to as a “contemporary interpretation of a barn.” The hotel is directly connected to Fair Oak Farms’ 17,000-square-foot Farmhouse Restaurant, pub and conference center, making it ideal for both personal and business travel. The hotel boasts 99 rooms and suites. The design features a contemporary barn exterior, layout and custom interior design. They incorporated a lot of modern materials, McCall said. The hotel’s public spaces and guest bedrooms feature original artwork created by three renowned artists. “We started within (Marriott’s brand guidelines), but we made everything bigger and better,” he said.